It is exactly eighteen months since I took the first photo of a few of the frames I had cut out on the garage floor for our Didi 40 Cr. Progress has been steady rather than spectacular and we have had many breaks for travel both within Australia and overseas. There is also time off for sailing Passion on Wednesdays and the Laser on Saturdays and Sundays. 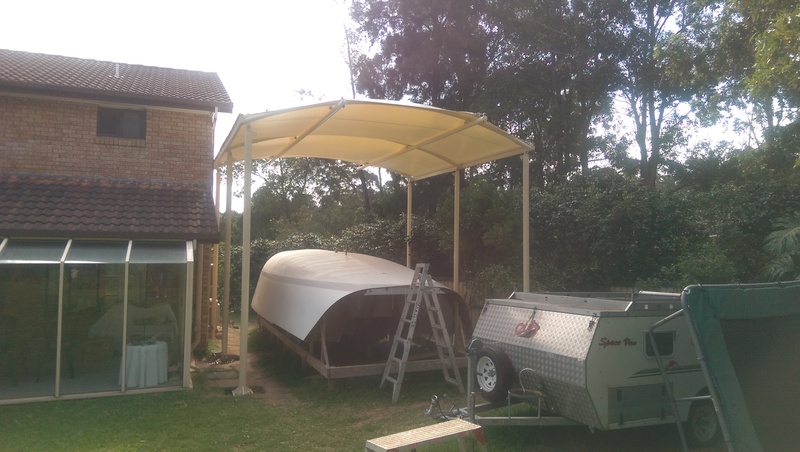 Initially I had an objective of launching the new yacht in time for the Port Stephens Regatta in April 2016 but with the many breaks from building I realised this was not possible. A new target date is to launch in mid August in time for the start of the 2016 twilight racing season in October. Today was spend sanding previously painted surfaces or preparing clear epoxy coated plywood for more clear epoxy. I did manage to coat a couple of feature panels with clear epoxy but the preparation took longer than anticipated and I need another three hours to complete the white two pack epoxy primer I had planned. For the record I took a few more photos to remind myself how much has been completed after eighteen months. The transom is marked up ready for the boarding platform. The widened cockpit of our Wide Stern version shows up well and the top bearing for the rudder stock is already glued in. The bulkhead on front of the galley will be painted white. 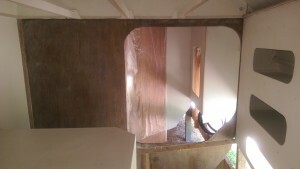 Looking into the dinette area from the V berth showing two coats of clear epoxy on the V berth ante room feature panel. 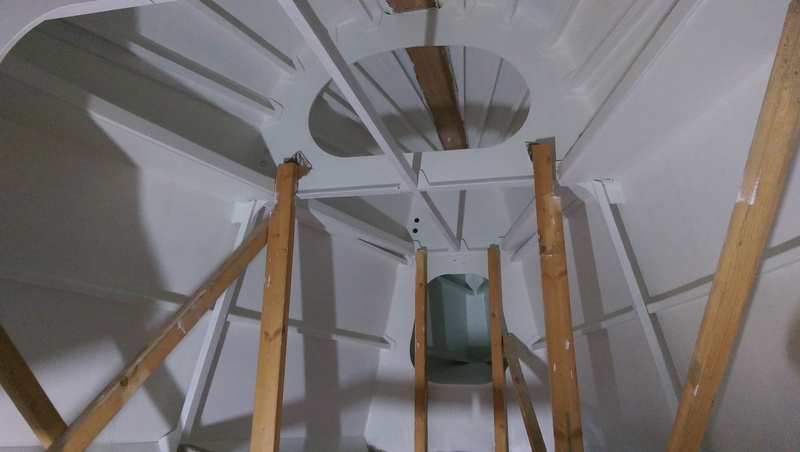 As more white two pack epoxy primer is applied the interior of our Didi 40 Cr is being transformed. Today I completed the priming in the V berth area and commended painting in the the settee area. Before applying the white primer I added a coat of clear epoxy to the mast step bulkhead that will probably be left as a varnished feature panel. 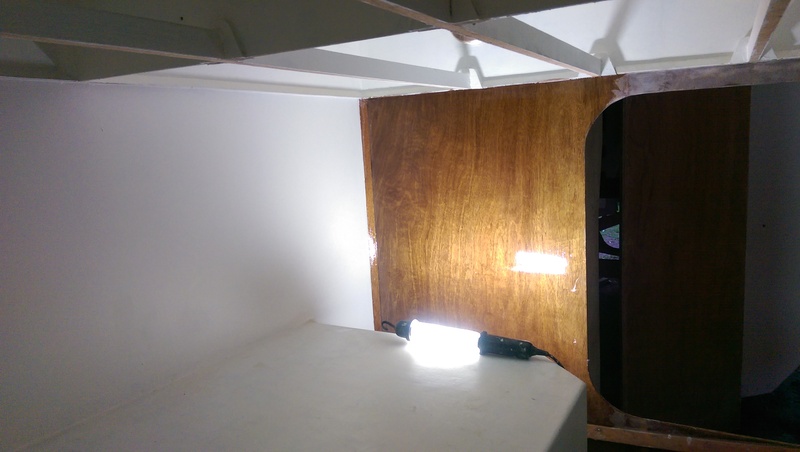 In the quarter berth I added a third coat of clear epoxy to the feature panel but after inspecting the finished job with a bright light I found a couple of areas of epoxy bloom in the second coat so I will have to sand these two coats back in a small area for the finish I want. No one else would notice it high up near the underside of the bridge deck across the cockpit but I would know it was there. A third coat of clear epoxy on the quarter berth bulkhead. 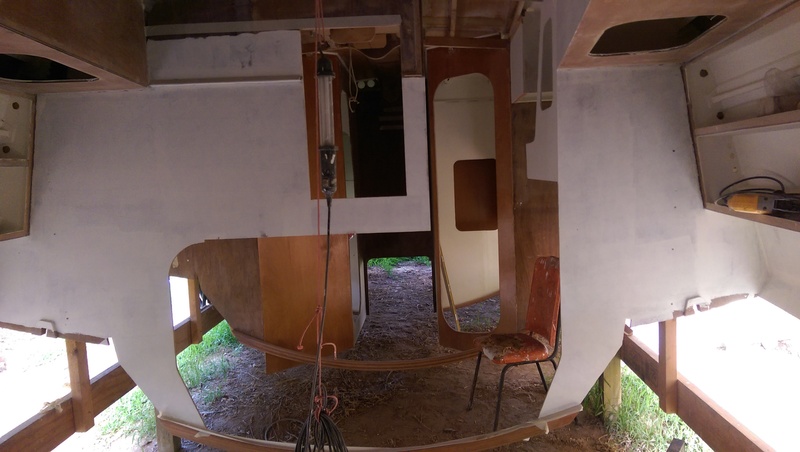 Tomorrow I am hoping to get a first coat on all of the settee area, a first coat in the galley area and a second coat on much of the settee area and the chart table. This is all in preparation for leaving it for a couple of weeks while we help out with the Australian Laser National Championships at Belmont. We transferred Passion to Lake Macquarie yesterday and bumped over the channel with the help of a tow from Lake Macquarie Marine Rescue. On the way out on the 5th of January we will have to find a higher tide. Passion has wings on the keel and we cannot tip her over to reduce the draft. The new boat has 500 mm more draft so Lake Macquarie will not be on the future visit list unless they dredge the channel more. Replacing the gimbal pivots on the Eno oven. 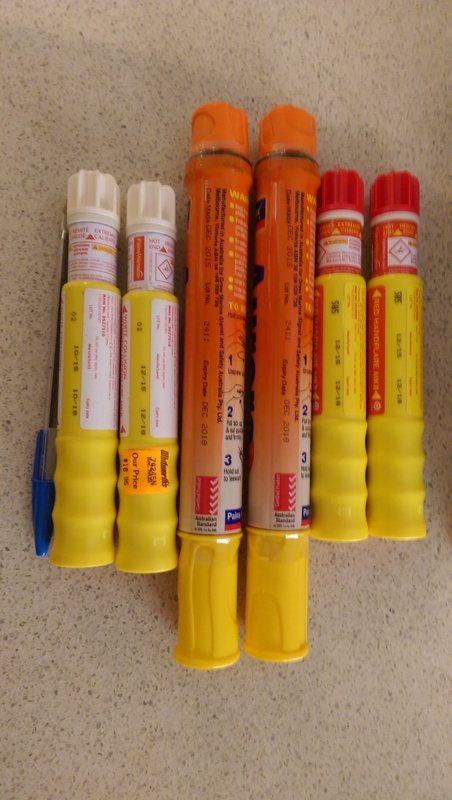 Buying a new set of flares that are in date. 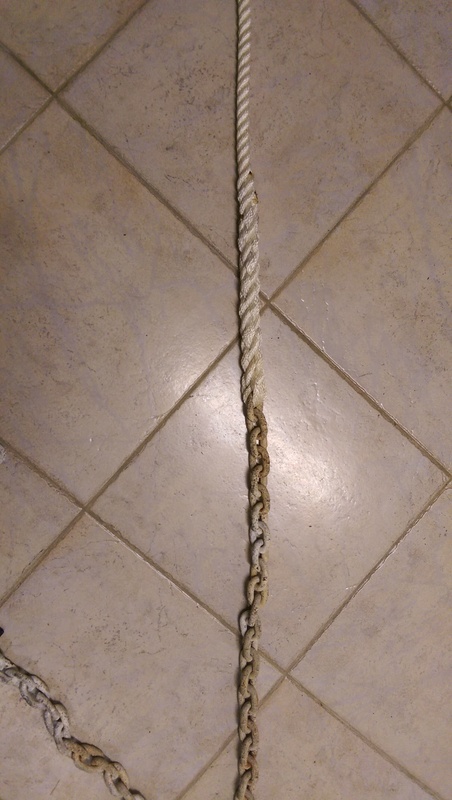 Splicing a new 46 metre length of nylon rope to the 23 metres of 10 mm chain so that we can anchor at the finish line without having to put the rope to chain splice through the windlass. Fitting the spray dodger and bimini. Loading with water and fuel. I still have to replace the pin in the hinges from the cockpit table that broke at Port Stephens last April but need some sharper drill bits to complete the task and the element in the water heater needs to be replaced if I want a hot shower without running the motor. Aside from these non essential items we are ready to roll. 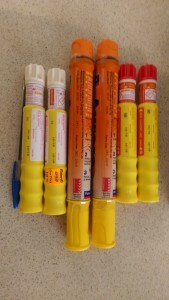 A fresh set of Cat 4 flares ready for Port Stephens in April and to be off shore compliant. 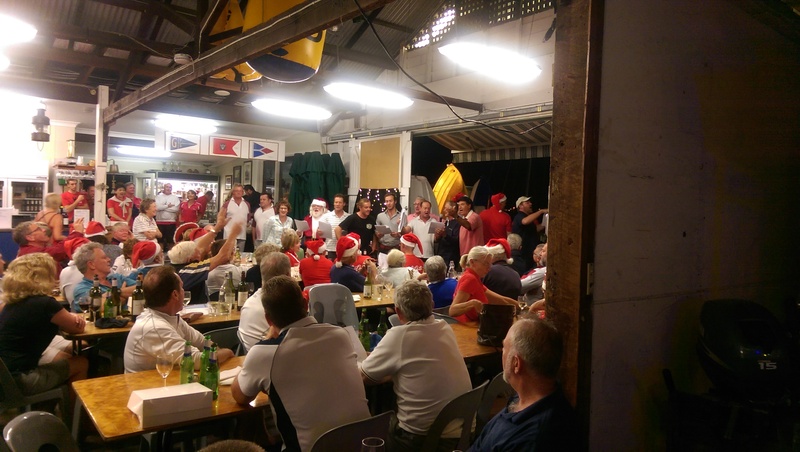 The team at Greenwich Flying Squadron are counting their blessings after the storms and damaging winds abated in time for the Christmas twilight race and BBQ. After the race we dined in the area normally occupied by racks of Sabots but the club was cleared of all movable items to make room for 200 members and guests inside and another 100 on the deck. 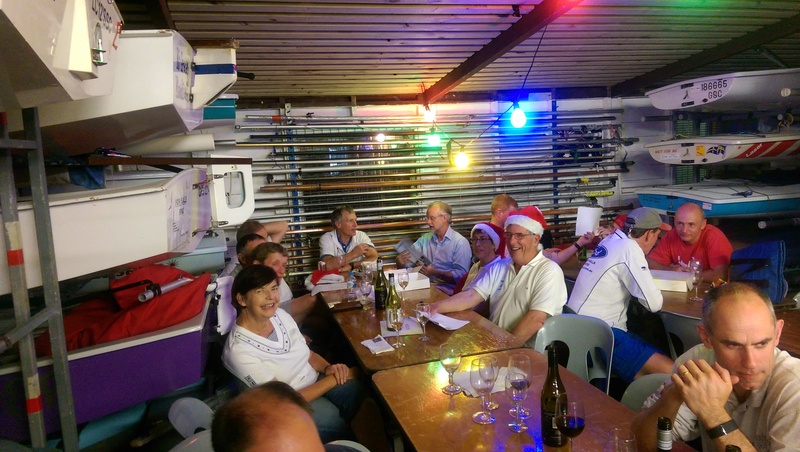 Passion’s crew dining in the Sabot storage area at the GFS Christmas party. Another angle on the Passion crew dining at the GFS Christmas party. On the water not one of the red division completed the course within the time limit as there was not enough wind for the smaller yachts. In our Blue division race we tempted fate on the start line with scarcely a breath of air behind us and an outgoing tide. Two of the fleet were on course side and only one bothered to return. Agrovation figured that by the time they beat back into no breeze against the tide the whole fleet would be long gone. By going on they at least had a chance to see what result they might have achieved. In the end they did beat us across the line courtesy of a lift on their side of Humbug but we knew they were OCS and were keeping a cover on Worlds Apart. So from the start we took the outside bend with stronger tide and more pressure but even then there were holes and with the breeze from behind we were often blanketed. Such was the case when Gwhizz and Worlds Apart came through and carried on with momentum. Up to then we had been following Jedi and considering ourselves to be fortunate to be so close. From that point Jedi disappeared from our radar as we focused on catching Gwhizz and Worlds Apart. With much advice from the two Laser skippers on the cabin holding the pole and boom out we steered deep away from Greenwich and were rewarded with better wind and a quick recovery into second place. We went so wide that I feared we would not make the big red navigation mark on the corner of Goat Island but we did it well. For once the run around Goat Island went well for us and as we hardened up for the beat home we had caught up to the White division and our friends in Capriole. It was almost as important to beat Capriole home as it was to stay in front of Worlds Apart so we followed her moves pretty closely. Against a tide that was approaching the top we made good angles up to Long Nose point and then took a lift just as we needed to tack away. Once around we were still chasing Capriole and had a Young 88 for company. We went below the Young 88 and to my surprise we soon pulled ahead and lifted up to her line. In these light conditions it is unusual for Passion to pass a Young 88 so I took a photo as a reminder. Did Passion really pass a Young 88? 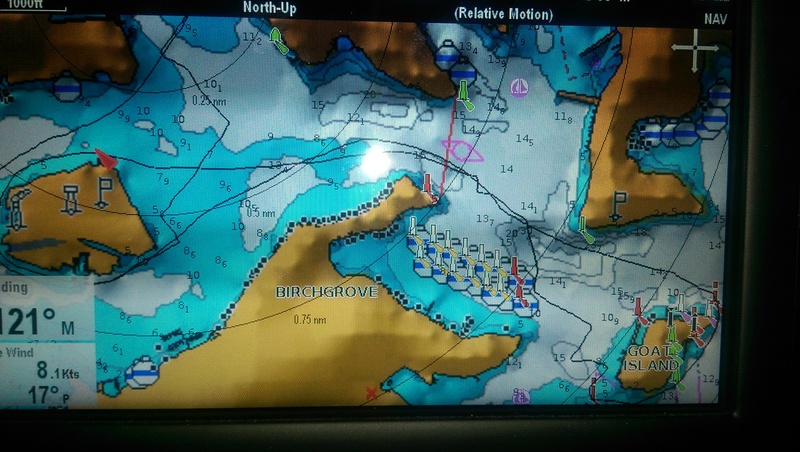 Humbug was frustrating as the tracks show as we needed to tack away from lifts at the line of moored yachts. Fortunately Worlds Apart was on the same line and while they were catching us we felt we had enough up our sleeve to make the finish. The long race time wise meant that the back markers had larger handicaps so I was pleased that we pipped Farrst Company by a fraction of a minute for second on handicap. Needless to say we were miles behind Jedi and they won on handicap by a big margin. The festivities after were enjoyed by all but it was a long night and the wrist watch pipped the midnight signal as I was disembarking from Passion at Woolwich. 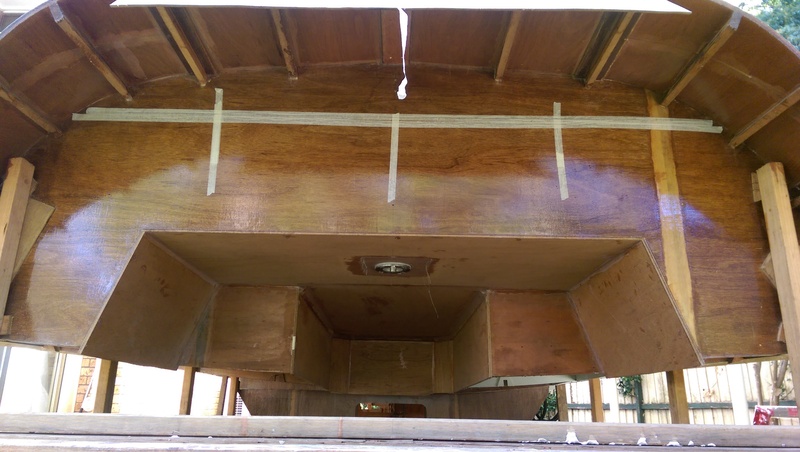 I have been installing the outer wings of the V berth bunk base as fixed elements glassed to the hull and glued to the outer bunk bearers. This makes the outer elements into a small “U” beam with the outer flange the hull and the inner flange the 22 x 44 mm meranti bearer. 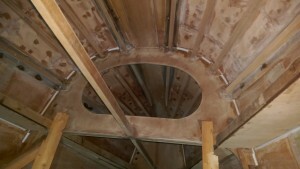 The web of the beam is then the 6 mm plywood which will be the outer edge of the bunk. 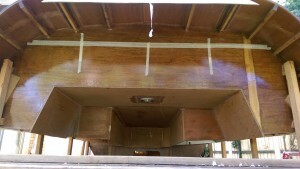 Apart from making a strong beam to resist slamming in the waves it produces a neat shape for the rest of the bunk top. I might hinge the bunk tops as I find the loose plywood top on our Jeanneau SO 37 difficult to hold open and as a result the large space under the bunk is rarely used. The locker fronts in the V berth ante room are now installed and have their first coat of primer on the faces. Inside the locker the painting is finished except for touch up after the deck is installed. There is still a seat to be installed in the ante room and under the seat will be a sizable locker. I am keeping the cut outs for the lockers in case we find it necessary to put door on some of the cupboards. There is now acres of boat ready for painting so that means another trip to the store for more paint. 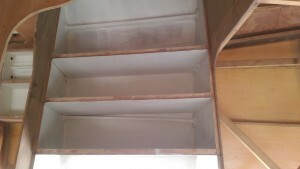 There is still acres of epoxy coated plywood to be sanded ready for priming. It is essential to take off most of the gloss to get good adhesion of the two pack epoxy primer. The same goes for any cleats that have to be epoxied to previously epoxy coated surfaces. 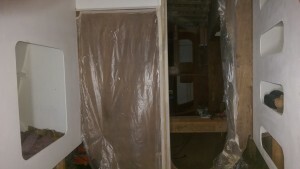 In most cased I take the plywood back to almost bare wood to ensure the strongest possible bond. 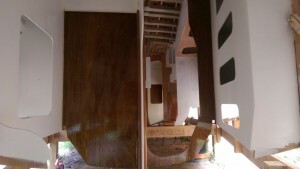 The plywood edges of the bunk tops have been converted into U beams by bonding the plywood to the hull and to the outer bunk bearer. 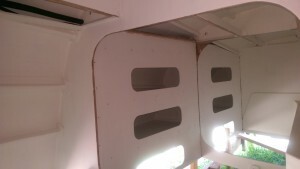 Shelves and hanging locker fronts in our Didi 40 Cr. The frame face is protected as it will be epoxy coated and varnished as an accent panel in a sea of white. In between big task I have been putting some finishing touches like rounding some of the furniture edges with the Makita hand router. 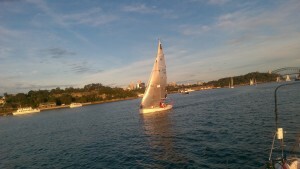 Wednesday’s twilight race at Greenwich Flying Squadron was a short sprint around Cockatoo and Goat Islands followed be a long wait for the approaching thunderstorm. The forecast suggested a big genoa but the wind on the water was significantly stronger so we opted for a conservative No 2 genoa and powering up the mainsail in the lulls. From the start we managed to protect our leeward position to reach Humbug ahead of the pack. As usual as soon as we rounded Onion Point we were blanketed by the fleet behind but on this occasion we were able to gybe to starboard and keep clear air along the Woolwich shore. Luckily for us the fleet went high up into the wind shadow of Greenwich while we did a big arc to arrive at Cockatoo Island behind Izzi. Saoirse was alongside us on the run down the Cockatoo shore and Agrovation was running up to us with gusts from behind the fleet. 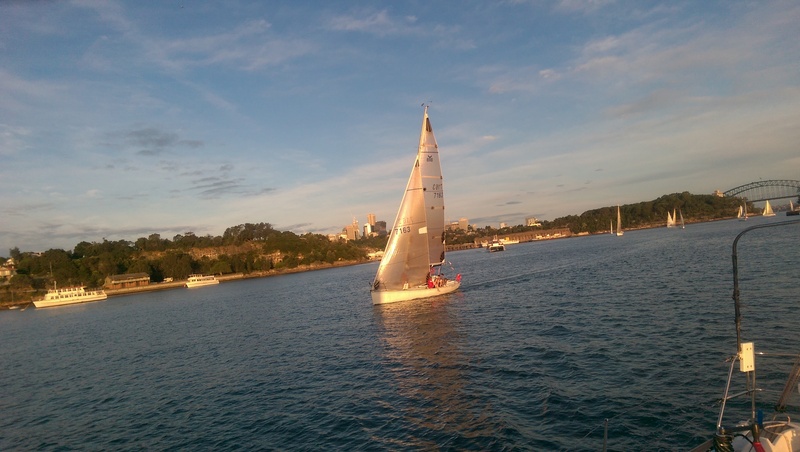 We kept as wide of the Cockatoo Island wind shadow as Saoirse to leeward would permit and managed to hook into the fresh wind ahead. By this time Izzi had a good lead and one which she kept extending all night. By Goat Island Worlds Apart had an inside overlap and we had to let her through and follow her home. Our elapsed time was not helped by an unfavorable knock at the corner of Cockatoo Island on the work to Goat and on the finish line where we needed two tacks to make the finish mark. 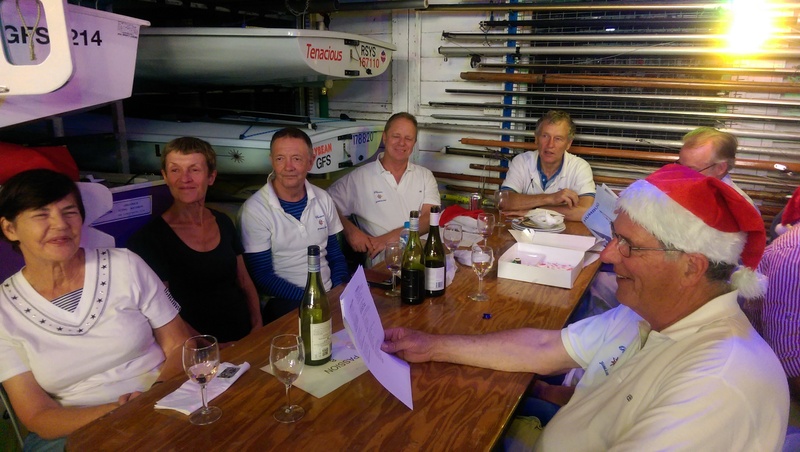 The third place over the line and fifth on handicap was a good result for the conditions considering our handicap which is just marginally behind Worlds Apart at the front of the fleet. Avanti made a late charge and was rewarded with a second on handicap with Izzi the clear winner on the night. The BBQ on the deck was a pleasant affair for those who finished their meal before the thunderstorm. While the rain was brief it was heavy and that brought the evening to an early close. For me it was a successful day as I was able to free up the bolts on the oven in preparation for replacing the gimbal pivots. Once I knew that the oven could be pulled apart I was able to schedule a visit to our favorite stainless steel fabricator to weld in new gimbal pivots. That task was completed today, Friday, in most pleasant conditions by motoring around to North Sydney, lifting the oven out, having the gimbal pivots replaced and reinstalling the oven. On the way out we had a good look at the remodeled Wild Oats XI and on the way back observed the exclusion zone being readied for the extreme sailing event. Back at Woolwich the temperature had climbed to 38 degrees C and the wind picked up from the West well in excess of the forecast. Back home it was still 36 degrees C and time for an afternoon nap before a couple of hours of sanding and painting on the new build. 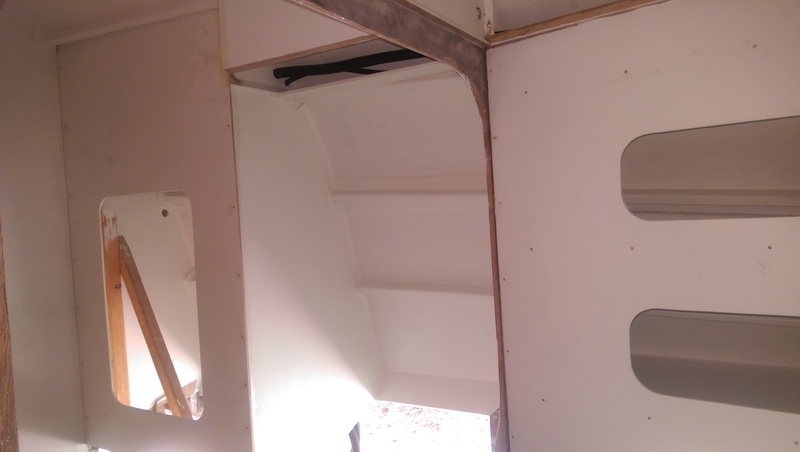 Today could have been a bit day of sanding and painting but I wanted to show some progress so I fitted a couple of locker fronts just for the photo opportunity. The front for the hanging locker in the quarter berth ante room of our Didi 40 Cr. Some cable organiser tube is installed behind the lockers. 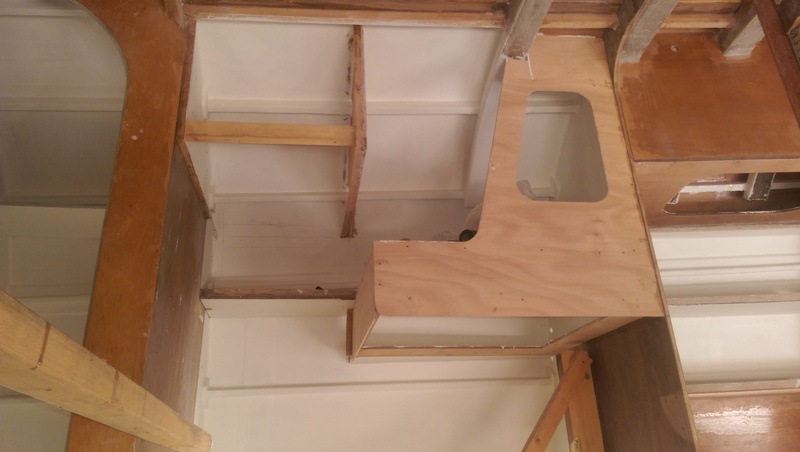 An accent panel of epoxied and varnished timber is going to be left in the quarter berth and other rooms. 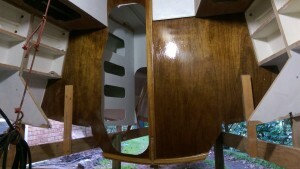 Two coats of Interprotect brighten up the vanity in the head. 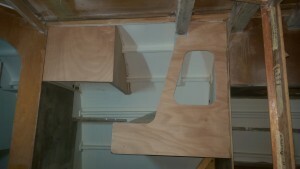 Just the end panel on the chart table seat is needed to be fitted before the hull is turned. 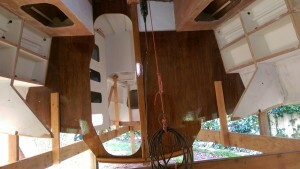 One coat of clear epoxy and a coat of Interprotect in the V berth ante room. One more coat of Interprotect and the locker front can be installed. 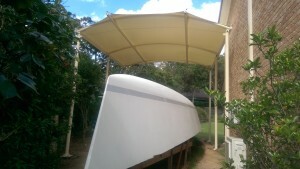 At last the awning is installed and just in time for summer. 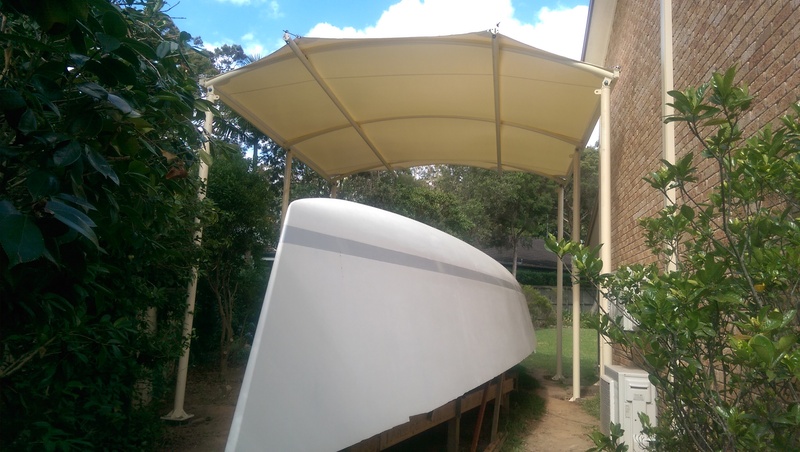 As soon as the shade material was pulled over the support structure the temperature under the hull dropped and working conditions improved. Once the grout under the supports cures we will be ready to turn the hull. This event will probable be left until after the New Year as I have some other activities planned and the hull is safe and dry while it is upside down. 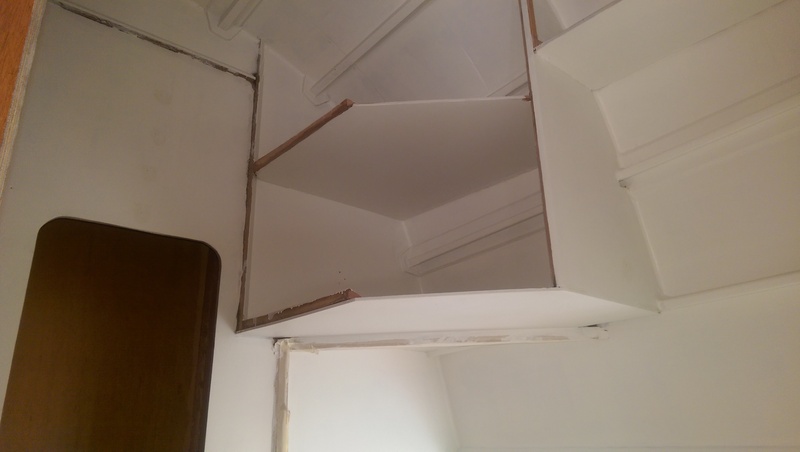 Today I cut and fitted the three shelves in the front berth ante room. They are grouted to the hull ready to be epoxied to the hull with a couple of layers of 475 gram double bias cloth. 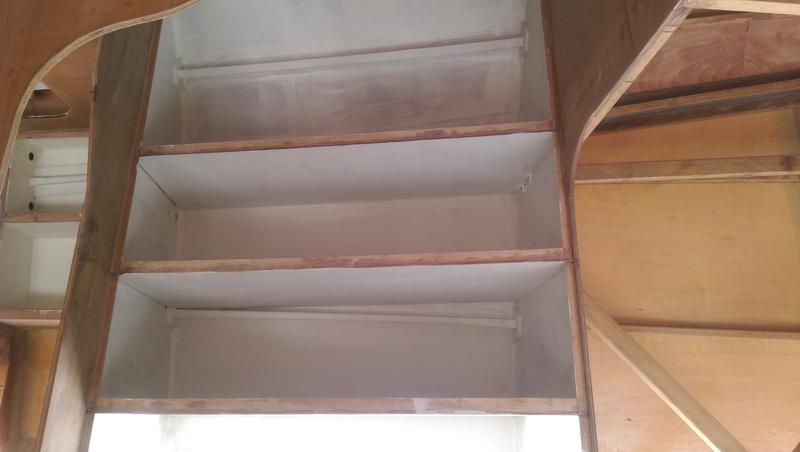 Then there are cleats to be glued to the shelf edges and the whole area primed with International Interprotect before fitting the locker front. This week we got the start just right being on starboard tack on the windward edge of the fleet. Agrovation tacked across the fleet on port and back onto starboard just ahead of us but then stalled allowing us to pull up alongside and to windward. As we approached Onion Point Agrovation wanted to pinch us out and luffed as high as they could go. With our small closely sheeted genoa and full main we were able to match their height but once they were headed and their genoa backed we were out of there. They could not tack on top of us and with the header they were stalled holding up the whole fleet to leeward. We tacked away much earlier that we would have liked but the prospect of Agrovation involuntary tacking onto port with the big header was too much of a risk and we did have the benefit of the lift. By sheer luck we shaved Onion Point at mid tide and just hung outside the line of moored yachts along the Woolwich shore. Looking back we could see the fleet becalmed in Humbug and we counted our good fortune to have scrambled away. While we had a big break on the fleet we were sailing with our smallest headsail and the wind was easing from the 25 knots earlier in the day so we took no chanced and tacked to cover any changes in the breeze. Out tacks to Cockatoo Island were pretty impressive and it does show the advantage of a small jib in shifty conditions. Behind we could see Irukandji had broken away from the pack and was giving chase. Their chance came on the approach to Goat Island where we were caught on the wrong side of two shifts. Our tacks here look as bad as our earlier ones look good and it was here that Irukandji made up all the lost ground. From there we had little hope of holding this longer lighter faster yacht on the reaches and runs home. We were rewarded with a second fastest by a good margin over Worlds Apart and a first on handicap to seal our spring series win. A series equal third on fastest times was also appreciated in such company as Irukandji, Jedi and Worlds Apart. Ron put our improved performance down to the 200 kg of lead we removed from the hull after the RANSA series. I am inclined to agree as we have managed to keep Passion moving in the big breezes without the lead and any weight saving is good for the light airs. The other factor in last nights good performance was the new forestay. Joe Walsh replaced the forestay we damaged last week and set up the rigging the way he likes it. 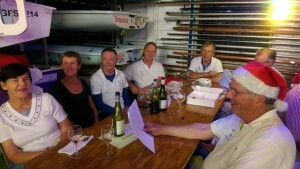 This is with less mast prebend and hence a fuller main which suited us in the lighter conditions. We made good us of the backstay to flatten the main in the gusts when needed so I think we will leave the rig a little looser from now on.